Attorney Marketing Network is a full service legal internet marketing company located in Los Angeles, California. Our professional SEO Consultants use ethical search engine optimization techniques to gain top search engine rankings for attorneys. Higher search engine positions result in increased website visibility and traffic, and lower the cost of customer acquisition. Attorney Marketing Network specializes in Search Engine Optimization for Attorney web sites. SEO (search engine optimization) will improve your law firm web site in the search engines for keyword terms that people type when looking for a local lawyer. Unfortunately, unless your website is on the 1st page of the search engines like Google, Yahoo and Bing for search terms that clients are searching when looking for an attorney, your website will not be found. There are thousands of searches each month from people who are looking to hire an attorney. And they are finding them on the Internet. 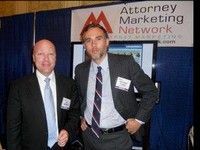 Attorney Marketing Network focuses specifically on high-converting internet solutions for your firm. Our strategies and law firm website design solutions that will help you grow your practice through the Internet. More people will visit your website than will ever walk through your front door. Give them the right message that you want to convey. Are you wondering how social media can work to drive more clients to your website. Like it, or not social media is the future of internet marketing. It is critical today to start working on your social media presence. We have proven strategies to integrate your social media and search engine optimization campaign to being to make Google happy and bring in new clients.